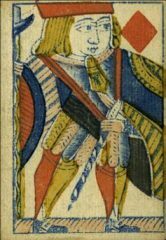 The English Playing Card Society was founded in 1984 on a non profit-making basis by Peter Way and Major R.T. ‘Donald’ Welsh. The website gives all the background and the advantages of joining. 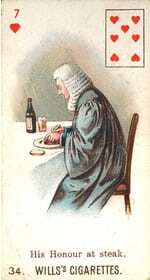 The International Playing Card Society. A quality site offering a sound insight into the subject – lots of depth. The World Of Playing Cards. This is the BEST Playing Card site on the Web for information and research. If you are interested in BOARD GAMES then YOU MUST visit this site – a fine repository of images and information. 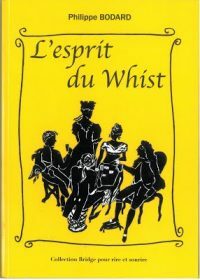 Philippe Bodard "L'esprit du Whist"
For Whist lovers you must read the latest book by Philippe Bodard “L’esprit du Whist”. A compilation of 200 stories from and about the greatest Whist players of the 18th and 19th Century. An excellent blog on the subject covering those published by Charles Goodall & Son during the period 1868 to 1922 – well worth a visit. 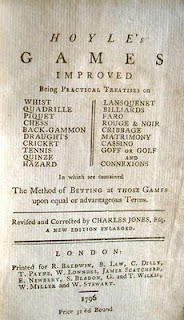 A man, who in 1742, published his “Short Treatise on Whist” and wrote his name in the annuals of games being probably more quoted than any other person, except for those talking on spiritual matters, for “According to Hoyle” entered the language shortly after his publication and had endured until today. If you wish to know more about this fascinating man then you MUST read David Levy’s website that provides valuable links to other articles and research by the author and others. Got a question about Playing Cards? Try this Link there is a lot of info there. Taxes and Tax Stamps on Playing-cards. pecializing in German Playing Cards but with a strong grounding on this subject for a wealth of other Countries – Peter Endebrock leads the way.